JRobert accompanies Gator Nate during the Florida Songwriters Showcase. 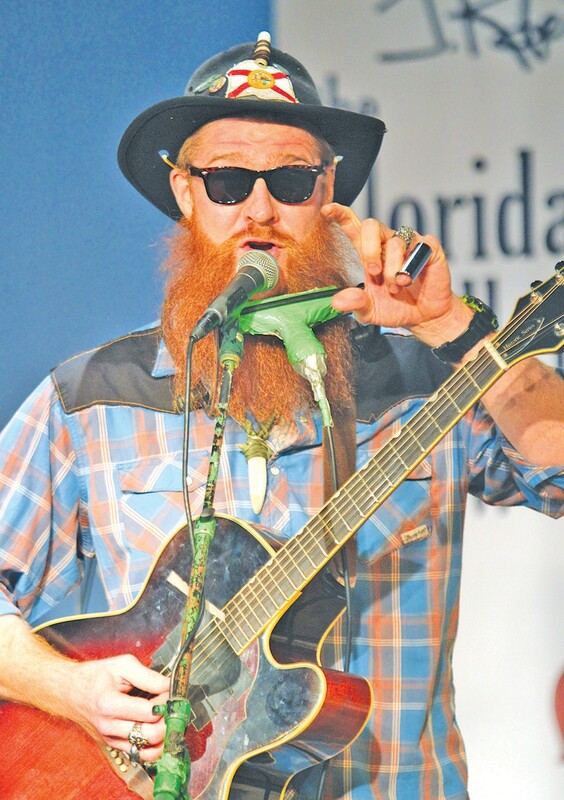 “Gator Nate” Martin captured the crowd the moment he bounded onto the Marco Players’ Theatre stage on Monday night, July 17—and he didn’t let go. 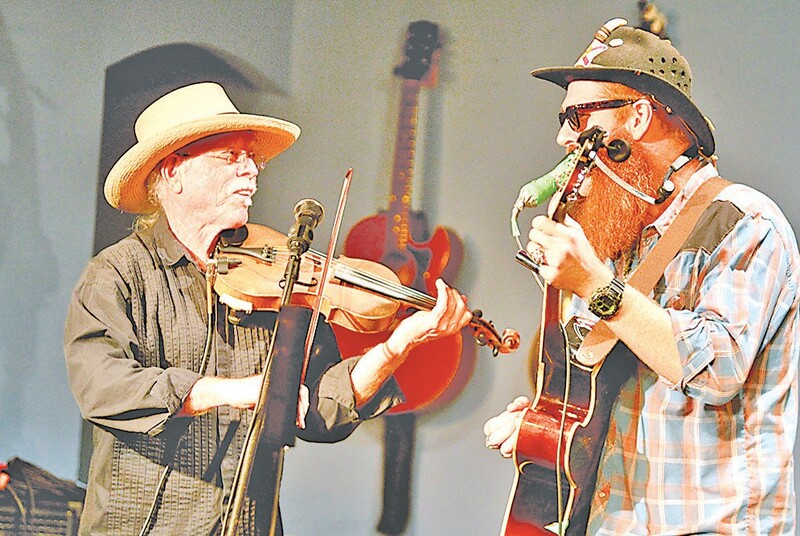 Wearing sunglasses (the lights hurt his eyes), a black hat with Gator Head written across the brim, topped by the Florida state flag and Yosemite Sam, Gator Nate immediately had the receptive crowd clapping and singing along during his first number. Such was the start of week seven of JRobert’s 13-week odyssey known simply by his growing audience as the Florida Songwriter Showcase. The nationally famous television show “The Voice” noticed Schneider’s talents and invited him to compete. Though he failed to “turn a chair” after performing in front of judges Adam Levine, Christina Aguilera, Cee Lo Green and Blake Shelton, he saw a side of the music industry few ever experience. 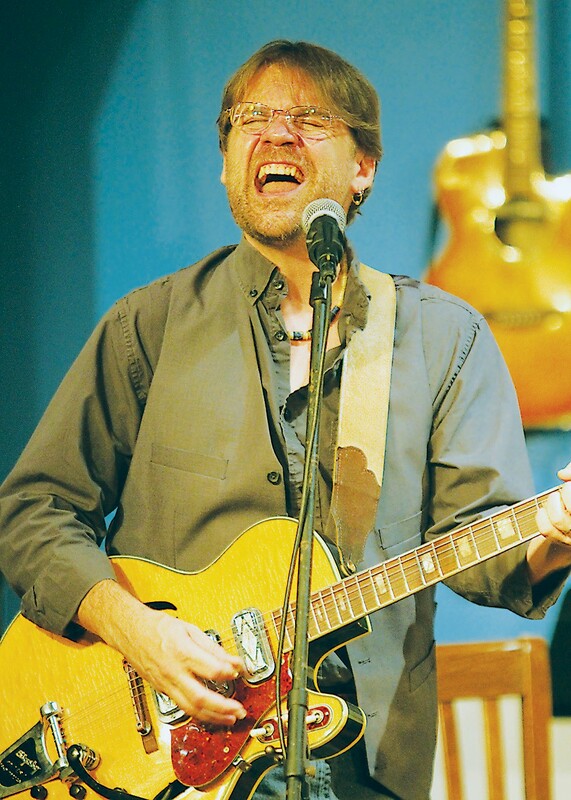 Schneider shared with the Marco Players’ Theatre audience how he was sequestered for two weeks, plopped in front of the judges to play his song, then unceremoniously ushered out of the building after failing to sufficiently impress the judges. He said he was not allowed to write a song about the experience, so he came up with a metaphorical version instead. His veiled nod to The Voice was perhaps his most captivating performance of the evening. The audience enjoyed Gator Nate’s stories as much as they did his songs. Gator Nate had two showstoppers in his set. The first was a poignant story about Mama Hokie (Clara McKay), who for years operated a stand along U.S. 41 in Big Cypress National Preserve that was identified with a sign that read BEER, WORMS. Gator Nate’s song tells of Mama Hokie having her hand bit off by an alligator (true story) and of her free spirit. On July 24 Ray Cerbone takes center stage. Captn Jac appears July 31. Tickets are available at themarcoplayers.com and 239-642-7270.